Master Instructor of Oriental Dance technique Shareen El Safy is back in the Bay Area! "Exploring the development of Oriental dance through the signature steps of the great Egyptian stars"
Study all week with Shareen! Shareen will also be holding a five-day retreat near Mendocino from July 11 to July 15, 2011. The workshop topic for the morning class is "Exploring the Development of Oriental Dance Through the Signature Steps of the Great Egyptian Stars"; 10 am-12:30. 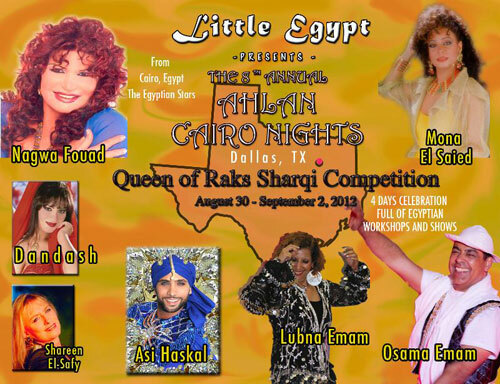 The afternoon class will feature a Power Point Presentation on the Dance Stars of Cairo; 2-4 pm. Gathered from Shareen’s personal interviews and photo collection, it includes philosophical perspectives and anecdotal experiences. Lines Dance Center, 26 Seventh Street, 5th Floor, San Francisco, CA. Lines Dance Center, 26 Seventh Street, 5th Floor. S.F. CA 94103-1508. Contact sponsor Monica Berini at 415/289-6670. More info on registration will be available soon, and it will be possible to download the flier at http://www.monicaraqs.com/shareen_2011.html.